Port commissioners will soon vote on plans for a $500 million-plus upgrade that would allow Terminal 5 to handle a new class of megaships. Capable of carrying more than 18,000 containers, such vessels have disrupted global shipping and sharpened competition between terminals in Puget Sound and their Canadian rivals in Vancouver and Prince Rupert. The Port of Seattle is one step closer to playing — or, at the very least, staying — in the big leagues of the global freight business. On Tuesday, officials with the Northwest Seaport Alliance, the joint venture between the ports of Seattle and Tacoma, unveiled a tentative deal with Seattle-based Stevedoring Services of America Terminals (SSAT), one of the world’s largest terminal operators, to manage a planned “big ship” loading facility on Terminal 5, just west of Harbor Island. The long-sought deal would be a major step in a proposed $500 million-plus upgrade to Terminal 5 that will allow the Puget Sound cargo gateway to handle more of the super-large freighters that are reshaping global trade. Capable of handling 18,000 or more 20-foot containers, or nearly twice as much as many of the vessels currently visiting West Coast ports, these massive vessels have brought huge cost savings to the freight business, and have helped drive down consumers’ costs of everything from toys to grain to consumer electronics. But that scale has also helped turn the global shipping business into a brutal competition among North American ports. With a final vote scheduled for Feb. 26, Wolfe and other alliance officials will spend the next three weeks trying to build public and political support for the massive project, the first phase of which could get underway as early as this summer. It’s an ambitious schedule, given the project’s massive complexity, large public costs, and substantial risk. 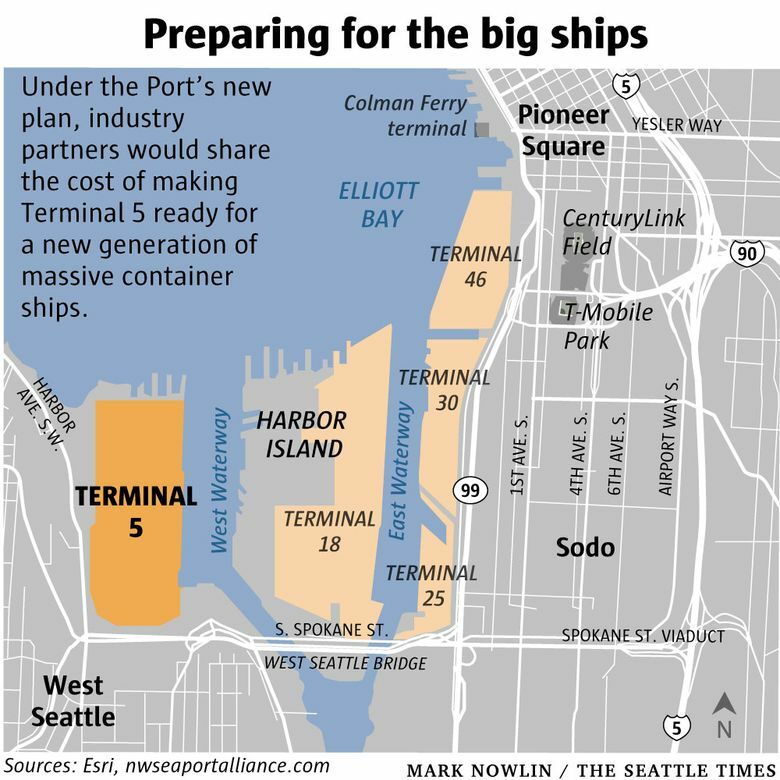 While Stevedoring Services and its partner, Terminal International Limited , could pay up to $250 million of the projected costs, the ports of Seattle and Tacoma will be on the hook for $340 million. In theory, the ports will earn back their investment by 2037 via lease payments from the terminal operators. But that best-case scenario could falter if the alliance’s anticipated cargo volumes fail to materialize or if the terminal operators elect not to participate in the project’s second phase. “There is no guarantee in anything, but we’re taking a calculated gamble,” Edward DeNike, president of SSA Containers, told commissioners during Tuesday’s briefing. Given how rapidly the global cargo market is changing, the real risk for a Terminal 5 upgrade isn’t that the best-case fails to materialize, but that even under the best case, the ports may struggle to meet their goals. The shift to larger, more cost-effective container ships has upended the entire shipping sector. The larger vessels require larger, more expensive facilities — deeper harbors, bigger and more powerful cranes, stronger piers and improved capacity to move the containers to and from truck chassis and rail cars. These realities have pushed ports into a costly arms race of infrastructure investments. Thus far, it’s a competition that the Seaport Alliance isn’t winning. Between 2012 and 2017, the alliance’s share of container cargo flowing into the Pacific Northwest fell from 43.7 percent to 39.5 percent, while the shares flowing into Vancouver and Prince Rupert has soared, according to PIERS, a cargo-data firm. A ship carrying four gigantic cranes passed through Puget Sound. Here's what they're for. One factor behind that shift is infrastructure: both Vancouver and Prince Rupert have poured hundreds of millions of dollars into new, state-of-the-art facilities, much of it geared toward ultra-large vessels. Both ports have plans for additional spending, according to Wolfe. But another factor is the higher cost of shipping through all West Coast U.S. ports. Thanks in part to Canadian government subsidies, rail costs between the Canadian West Coast and the U.S. Midwest are far lower than the same trip from U.S. West Coast ports such as Seattle-Tacoma or Los Angeles-Long Beach. U.S. ports also impose a special Harbor Maintenance Tax, stemming from federal clean-water regulation, which adds as much as $150 to the cost of shipping a container, according to the alliance. The Seattle and Tacoma ports are also hobbled by higher labor costs, according to SSA’s DeNike. All told, shippers can save around $400 per container by offloading at Canadian ports compared to U.S. West Coast ports, according to a 2018 study by the Alliance. Another threat: With the widening of the Panama Canal in 2016, shippers find it increasingly cost effective to bring their cargoes in to the United States via East Coast and Gulf Coast ports. That shift comes at the expense of Seattle-Tacoma and other West Coast ports. Between January and September of 2018, West Coast container imports increased just 3.3 percent, while East Coast ports saw a 6.3 percent jump and ports on the Gulf Coast saw a 10.6 percent increase, according to data from PIERS. No one is pitching the Terminal 5 project as a cure-all. Even the most ardent boosters at the alliance acknowledge that, in the short-term, the upgrade is really about stemming the defection of shippers to other ports. “This investment is more about ‘build it so they will stay’ rather than ‘build it and they will come,'” Don Esterbrook, the alliance’s deputy CEO, told the commissioners. Port officials can expect some pushback from local residents and politicians. Beyond the project’s financial risks, the terminal upgrade could mean environmental impacts and noise from increased vessel traffic. It also comes in the wake of embarrassing revelations over the Port’s contracts and the resignation of former CEO Ted Frick over improper executive bonuses. At Tuesday’s briefing, several Port commissioners pressed Wolfe and other Port officials over the risk that the upgrade might not deliver projected cash flows. The ports of Seattle and Tacoma represent some of the last places in the region that are still generating middle-class wages: the 20,100 jobs directly supported by the ports carry an average salary of $95,000, according to Port of Seattle figures. Every new increment of container traffic that the Port wins — or that it doesn’t lose — represents the kind of “jobs that allow you to live and work in Seattle,” said Bowman.